AHK Test Suite is a testing framework written in the AutoHotKey scripting language. Its purpose is to automatically test applications running under the ReactOS operating system. AHK Test Suite runs in the VBox virtual machine (VM). 60sec from last debug output until "[SYSREG] timeout" and OS is reset. Note: for details on git see Git for Dummies. 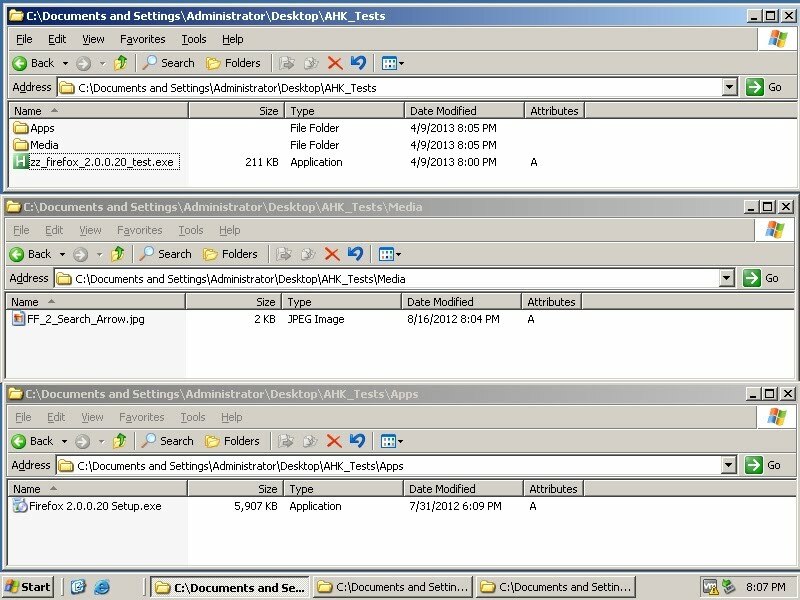 1) Create a folder you want AHK Test Suite to be downloaded to (e.g. R:\src\ahk_tests). 2) Navigate your file manager to the created folder. 3) Right click and choose 'Git Clone'. 'Git clone' window will appear. Type '<your%20username>/ahk_tests https://github.com/<your username>/ahk_tests' in 'URL of repository' field and hit OK button and wait until things are downloaded. Then, download Applications and Media from here. Warning: these files are unmaintained. See ONLINE-716. If something is missing you can ask Edijus or Caemyr in IRC channel (irc.freenode.com, #reactos). 5) Hit 'Compare selected Results' button. Picture below demonstrates all the steps. Scroll down the newly opened page until you see tests that start with 'zz_' prefix. In order to run a test, you need to compile it. 1) First, download the test (how to do so check titles above). 2) When download is done, you need to compile using Ahk2Exe.exe (AutoHotKey v1.0.48.05 is used when compiling ReactOS tests). 2) When Ahk2Exe window appears, hit "Browse" button in in "Source (script file)" and open file that matches 'zz_*_test.ahk' file pattern (e.g. 'zz_firefox_2.0.0.20_test.ahk'). 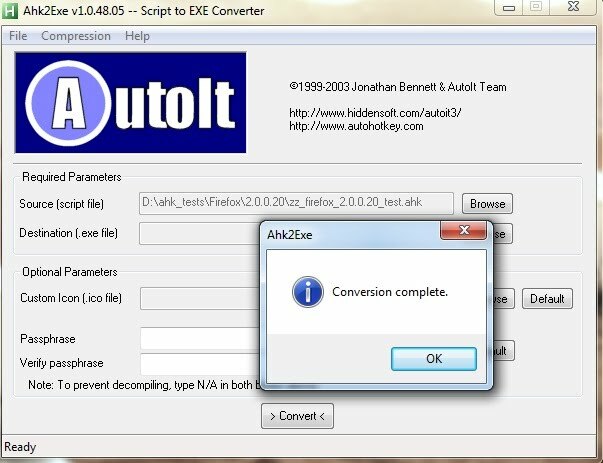 3) Hit "> Convert <" button and dialog box saying 'Conversion complete' will appear. If compilation went successfully, a 'zz_*_test.exe' (e.g. 'zz_firefox_2.0.0.20_test.exe') file will be created. All .ahk files that are #included will be bundled into the output 'zz_*_test.exe' as well. There are dependencies. You are going to need the exact same test application version as described in test (e.g. 'Firefox 2.0.0.20'). Download Applications and Media from here. You need to create two folders in target machine 'Apps' and 'Media'. You put test program *.exe (e.g. 'Firefox 2.0.0.20 Setup.exe') in 'Apps' and rest of stuff (e.g. 'FF_2_Search_Arrow.jpg') in 'Media' folder. The compiled script executable goes into root folder. Note: All compiled scripts go into the same folder and all use the same 'Apps' and the same 'Media' folder. Picture below demonstrates folder hierarchy. Now, all you need is to start test executable by passing test name via command line (e.g. 'D:\AHK_Tests\zz_firefox_2.0.0.20_test.exe 1.install'). Results will be displayed in debug output. Debug output can be monitored with DebugView application. Picture below demonstrates how results are displayed in DebugView application. Firefox 12.0 for applications that haves no nice control names. This is so we can have the same application tested, but different version e.g. Firefox\2.0.0.20, Firefox\3.0.11, Firefox\12.0, etc. There are different ways of making an application do things. You can use mouse to click controls and you can use keyboard. Sending keystrokes is not the most reliable thing to do, but sometimes applications do not have control names. In such case (e.g. Firefox 12.0 case) send keystrokes (e.g. Alt+N to click 'Next' button, etc.). We want tests to consume as little time as possible. Sysreg will time out ([SYSREG] timeout) if there is no debug output in 60 seconds. Do not create too many indentations - 5-8 is the number we would like to see. to make sure you sent text to correct window and not some error box. File name and specific test name must match. For example test name '2.address_bar' and file name 'address_bar.ahk'. Test and file names are case sensitive. If you are trying to access some file, make sure it exists first. If you close an application, make sure that not only window has closed, but application process too. This page was last edited on 26 November 2018, at 21:00.